Students at John H. Taggart Elementary School in South Philadelphia got a crash course in parks and recreation. And they couldn't be more excited. 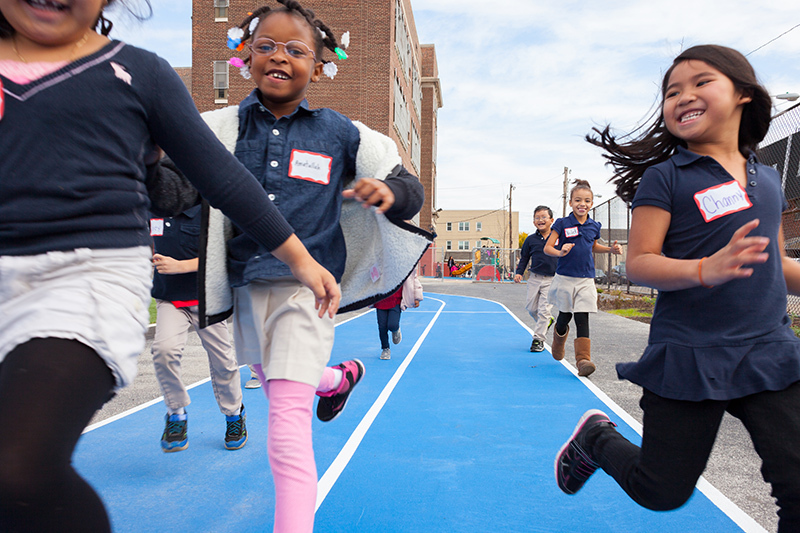 As part of The Trust for Public Land's participatory design process, we worked with Taggart students to develop a new schoolyard concept that fosters learning and creativity, encourages exercise, and honors the diversity of the school's student body that collectively represents 27 different languages. While the new half-basketball court and running track provides endless opportunities for play and exercise, students also learned how design can benefit the environment. Replacing a barren blacktop with a turf field and rain garden not only gives the kids a place to play, but is also a way to manage storm water. The student design also includes a stage for outdoor performances, a colorful world map mural reflecting their geographic diversity, and a new sculpture of the school's mascot, the Taggart Tiger.